Japan's decision to leave International Whale Commission and resume whale hunt draws widespread international criticism. Japan’s argument is that the commission was set up in 1946 to manage commercial whaling, not to ban it. Commercial whaling was banned by the IWC in 1986 after some species were driven almost to extinction. 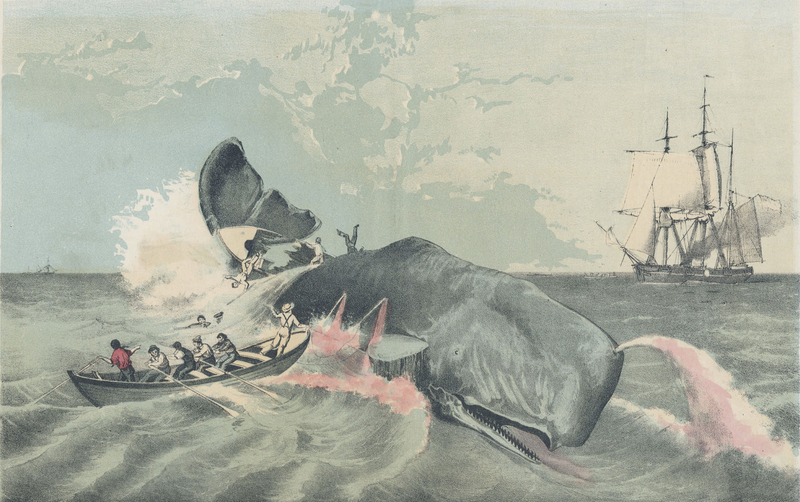 1856 Advertisement depicting a whale hunt. Japans announcement that it is withdrawing from the International Whaling Commission and will resume commercial whale hunting next year, have sparked swift condemnation from other governments and conservation groups. For many years Japan has hunted whales for what it calls "scientific research" and to sell the meat, a programme widely criticised by conservationists. After failing to reach an agreement at a global conference in Brazil in September to resume commercial whaling, Wednesday's announcement had been expected, but conservation groups warn the move will have serious consequences. Officials in Japan, an IWC member since 1951, say eating whales is part of the country's culture and it has accused It accused the IWC of being focused only on the aim of conserving numbers. In reality, Japan always flouted the moratorium, using a loophole that allowed “scientific research” to continue slaughtering thousands of minke, fin and sperm whales far from its shores and selling their meat on the domestic market. Secretary Suga stated commercial whaling would be restricted to Japanese territorial waters and economic zones. As a result, Japan will cease taking whales from the Antarctic Ocean and Southern Hemisphere, a prospect conservation groups had welcomed before it was formally confirmed. Suga said the hunt would respect catch limits based on IWC calculations, "to avoid negative impact on cetacean resources." This portion of Japan’s decision was welcomed by Australia, which has supported sanctuaries to protect Antarctic whale populations and which challenged Japan’s “scientific research” in the International Court of Justice in 2014. Australia won, but Japan made some cosmetic changes and kept hunting. In a joint statement, Australia's Foreign Minister Marise Payne and Environment Minister Melissa Price said they were "extremely disappointed" with Japan's decision. "Australia remains resolutely opposed to all forms of commercial and so-called 'scientific' whaling," the statement added. According to Bloomberg a Japanese foreign ministry official told reporters Thursday in Tokyo that whalers were also upset with the plan and the move to end “scientific” hunts in near Antarctica was opposed by the local whaling industry. The official who declined to be identified according to ministry policy called the decision to end hunts in the Southern Ocean — where Japanese whalers have sometimes clashed with environmental activists — a “painful” one.